Moto FBM (Fabbrica Bolognese Motocicli) 224 Via Battindarno, Bologna, Italy was founded in 1951 by Vittorio Minarelli and Franco Morini, nephew of Alphonso Morini. The two young Italian engineers produced 125 to 250cc motorcycle engines for other makers. In 1954 Minarelli and Morini made their first moped engine, the P48 Pettirosso, a 48cc 2-stroke 2-speed cable-shift type, and later the P3 3-speed version. See Misc Italian, scroll to Moto FBM. 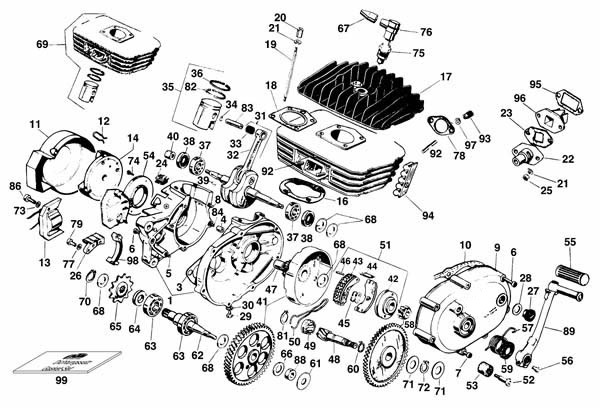 In 1956 Moto FBM split into F.B. Minarelli and Motori Morini Franco. See Minarelli Motor. Motori Morini Franco is not Moto Morini. 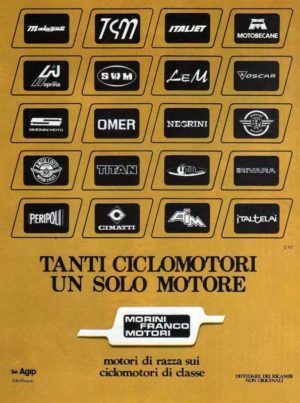 Moto Morini was founded in 1937 in Bologna Italy by Franco Morini’s uncle, Alphonso Morini. Alphonso Morini was an accomplished motorcycle racer and mechanic. Since 1925 he was building motorcycles and setting world records. Moto Morini is most famous in the US for their 1970’s 350cc V-twin motorcycle, Moto Morini 3½. See Wikipedia. Motori Morini Franco is not F. Morini. 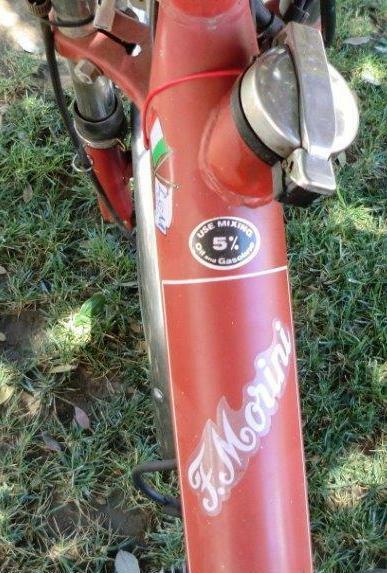 F. Morini is a US-model moped brand name, made by Lem. See F. Morini. 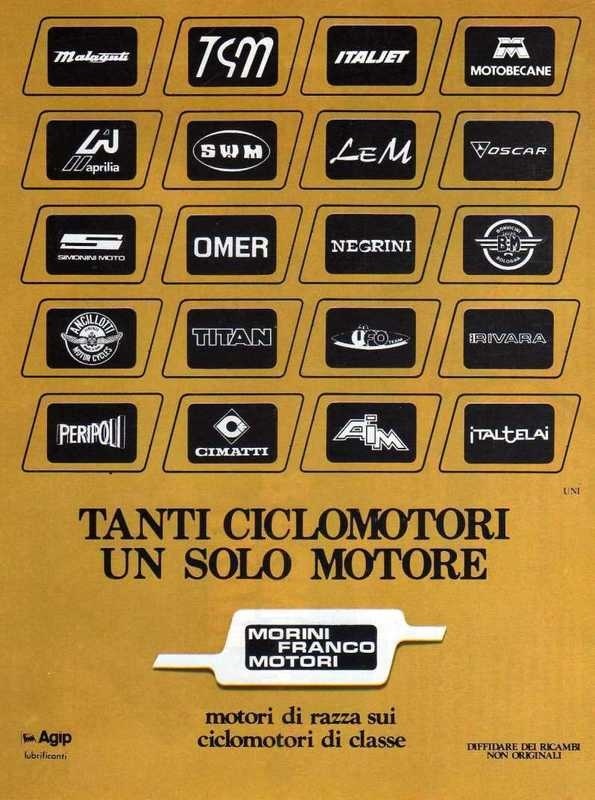 Hereafter, “Morini” means “Motori Morini Franco”, not the others. (many mopeds, only one motor). Tecnomoto, T.G.M., Titan, TM Racing, Ufo, Velomec, Viking, West Wind. 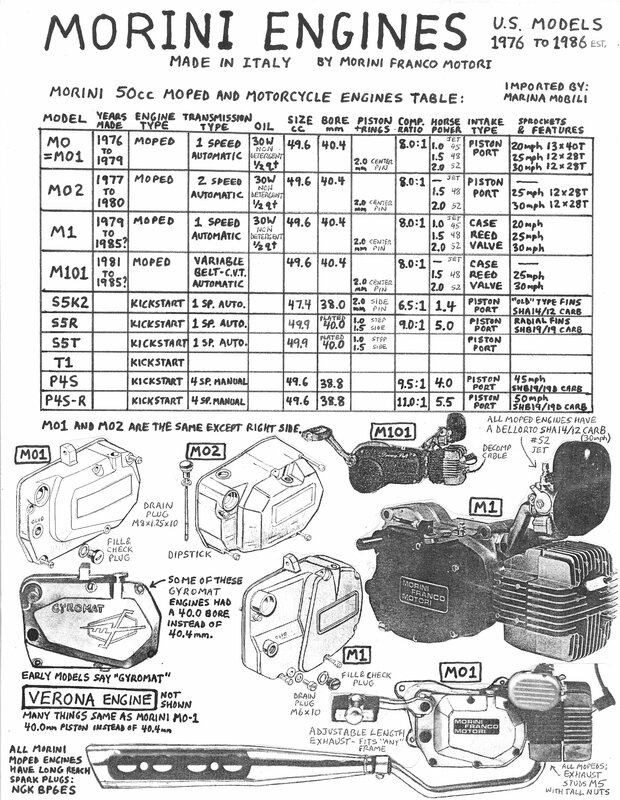 This list came from the 1980 Marina Mobili Parts Catalog (black notebook) and 1985 Marina Mobili Parts Catalog and Master Price List, with 1988 updates (yellow notebook). 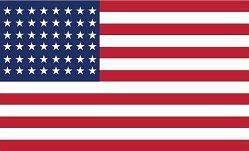 It is for US models 1976-88. Other models from different times and places might also have some of these parts. 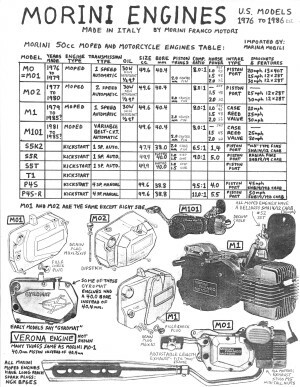 MMI: In the late 1970’s US moped dealers got their Morini engine parts from the bike brands they carried, such as Negrini, Malaguti, and Pacer. In the 1980’s Marina Mobili Inc (MMI) bought out those and many other brands, and combined the inventory into one source. 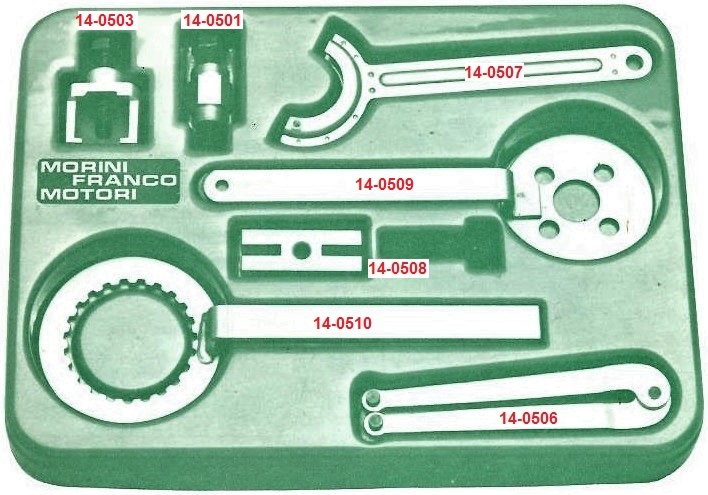 MMI also imported parts directly from Italian manufacturers like Franco Morini, Minarelli, Dellorto, CEV, Grimeca, and others. Besides pedal-powered mopeds, Franco Morini 50cc kick-start engines were on US models of mini-cycles, such as 1970’s Indian (Italjet). Parts for those with S5K2, S5E, S5N, S5R, and S5T 50cc engines are included in this MMI master list. Eight applications columns contain illustration numbers from these six illustrations. Prices: bright green is new, dark green is used, N/A is not available. Specifications are in orange. Morini numbers from Marina Mobili 1988 price list are in dark blue. Add-ons are gold. Here are the right side clutch covers, useful for identification. All are 50cc automatic transmission. All except S5R are limited in power and speed. M1 also has a kick version M1K, not shown here. 000 000 000 000 000 000 000 000 10-1089 N/A shaft, prim. with gear xxxxxxxxx for ?? 000 000 000 000 000 000 000 000 11-0021? $35 connecting rod assy, bearing-type for ?? 000 000 000 000 000 000 000 000 16-3015 N/A rubber block for S5K2 ?? 000 000 000 000 000 000 000 000 16-3032 N/A rubber grommet for ?? 000 000 000 000 000 000 000 000 23-2580 $15 drive sprocket 14T splined for S6? 000 000 000 000 000 000 000 000 25-4008 N/A washer, plain Ø3 Ø6? x1.0? for?? 000 000 000 000 000 000 000 000 25-4010 N/A washer, plain? Ø?? Ø?? x ??? for ?? 000 000 000 000 000 000 000 000 26-1005 Rings piston ring 40.0×2 L-type? standard upper MO4, MO5? 000 000 000 000 000 000 000 000 26-1016 N/A piston ring 40.0 x 1.5 GI? standard lower for MO4,MO5? 000 000 000 000 000 000 000 000 26-8037 N/A pin for ?? 000 000 000 000 000 000 000 000 27-7047 N/A spacer for M101 ?? 000 000 000 000 000 000 000 000 29-0063 N/A magneto Dansi 102362 ign gnd int for ?? 000 000 000 000 000 000 000 000 29-4069 $0.60 bolt M5 x 35 hex head for ?? 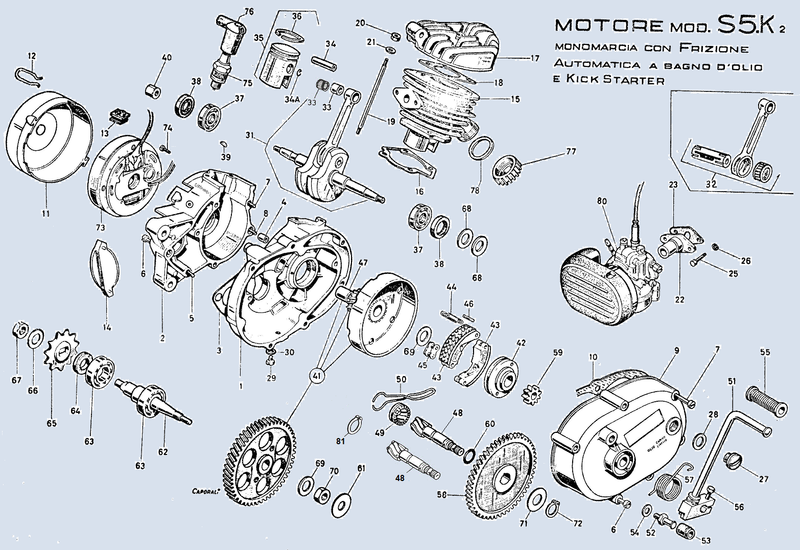 You are currently browsing the archives for the Morini Engine category.